The Latin-American in me is always torn when I’m at the grocery store. Maybe its that or that fact that I’m still drunk from the night before but meals such as “Chicken Noodle Soup” or latin comforting “Chicken Pozole” were circling my mind. I stood staring down the middle of isle 7 hungry and confused. Until the sober in me came out and asked, “why don’t you make them both? ?” After being mind blown for 10 seconds, my brain started to create the best recipe I could for a struggling lush (like myself). Something warm, slightly spicy and nutritious that would bring me and my life back to normal with little to no effort! I Hope you enjoy it as much as I did! Here we go! 30 minutes, $20 dollars, and 10 easy steps! Easy as 3-2-1! In a large pot fill it with water to a half way mark and set it to boil on high heat. While the water is warming up, cut your half of sweet onion in half (two 1/4 pieces) and smash you garlic cloves (3) still keeping them whole. Drop both onions and garlic into boiling water when done. Now that the water is boiling, drop both bone in chicken breasts into the water, be careful not to splash yourself, its hot! With one table spoon each of salt and pepper. While your chicken is cooking, its veggie prep time. Cut/ dice/ slice your carrots, squash, limes, celery and de-stem your cilantro. (Tip: if you put everything into a bowl once its cut its easier to drop into the soup to avoid burns). Once the chicken looks almost done remove them from the stock and set them on the cutting board to cool. This is very important since we’ll be hand shredding our chicken and you don’t want your fingertips to fall off from the heat. While the chicken is cooling this is when you will drop in the chopped veggies and 6-8 leaves of cilantro, reducing the heat to a medium temperature. You don’t want your veggies to be too hard or too mushy so a slow cooking temp is ideal. Once its all shredded, drop the chicken slowly back in, now you can add your hominy (strained and rinsed) into the soup as well as another tablespoon of salt and pepper and now add your chili flakes. Reducing the heat to medium-low and gradually stirring the soup for the next 10-15 minutes. This will allow all the flavors to lock in and gives your soup that homestyle taste. Plate your soup and garnish with a few lime squeezes, some fresh cilantro and a few shakes of chili flakes and voila! 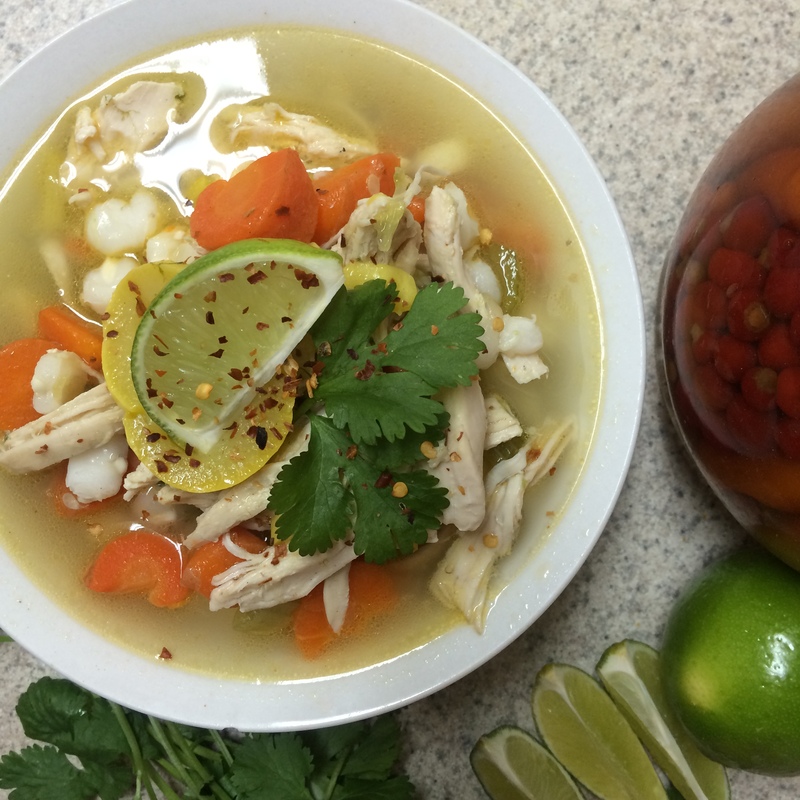 Thats my recipe for a perfect fusion of Chicken Noodle soup and Chicken Pozole! If you have any other hangover cure remedies, send them over or let me know your experience in the comments below!